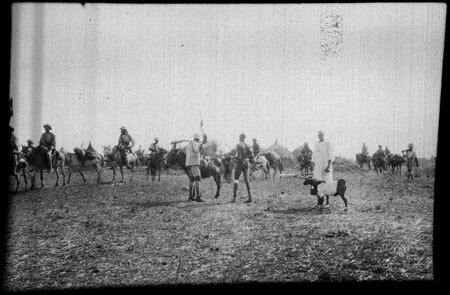 A poor quality image of mounted Sudanese soldiers patrolling through a Nuer village, two carrying flags. This appears to be associated with the photograph which shows a mounted European official (probably Percy Coriat) leading a party of soldiers. Morton, Chris. "Patrol in Nuer village" Southern Sudan Project (in development). 03 Jan. 2006. Pitt Rivers Museum. <http://southernsudan.prm.ox.ac.uk/details/1998.204.5.71/>.